How to combat tired eyes? How to combat headache and tired eyes? mean that you can see. Stress, eyes strain, constant tension, heredity – these are factors that undoubtedly hurt your sight, especially if you are already suffering from a certain sight-related conditions and are wearing glasses for a longer time. A year or two of hard study or work and you already starting to feel bed, when you need to recognize the number of incoming bus, read small letters on the computer screen or recognize and old friend, before he speaks to you. Pregnancy for women and inappropriate work conditions is all it takes – and the eye doctor already prescribes glasses with horrifying number denoting diopter of your new glasses. And also the headache. Just remember that you keep taking pills ever more often, because without them you just can’t relax and forget about the stress. Thanks to significant inventions and development in biophysics, which combines physics with classic medicine, the effect of magnetic field on humans, our organs, neural system, enzymatic system and even our own magnetic field was confirmed. The external magnetic field affects acupuncture points and can therefore influence metabolism, blood circulation, oxygenation, nutrition of tissues and organs. Effects resulting from the magnetic field were recently used for treating diseases more and more frequently. We are offering you a device that combines knowledge from the field of magnetism with a theory of acupuncture which is recognized as a heritage of ancient Asian medicine. This device combines magnetic and mechanic effects on important acupuncture points around eyes. Such effects help normalize sight function and stimulate inner Qi energy, as well. The device design was created using computer program and it thoroughly corresponds to area around eyes and acupuncture points in this area. The device has 22 massaging fingers made from high-quality non-allergenic silicone. Silicone makes massaging fingers soft and flexible, which makes use of OptiMaskPro impressively efficient. There is a permanent magnet made from alloy of precious metals at the tip of each finger. Motor of the device ensures influence on acupuncture points with frequency and intensity according to one of nine massaging modes. OptiMaskPro affects problematic area as fine fingers of experienced massager. The eye muscles are relaxing. The feeling of tiredness disappears. Permanent magnetic field influences metabolism and blood circulation. Sight gets better in case of regular use. The procedures with OptiMaskPro massager are very convenient. It only weighs 280 grams. You can use it at home, in the job, on the business trips or while traveling. 9 different massaging modes allow to massage eyes with various intensities. 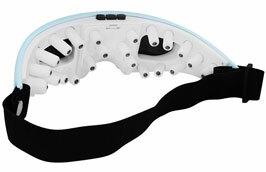 We recommend using eye massager OptiMaskPro to everyone who wants to recover 100% sight. Students at high schools and universities who are starting to suffer from fake shortsightedness due to cyclospasms caused by overwork. Working people who have job that puts eyes under a lot of pressure, such as programmers, accountants, designers, teachers, drivers or people working with the PC during their entire worktime. People suffering from presbyopia (deterioration of eyes accommodation ability due to high age, which is treated by glasses with positive diopter). In case when wrinkles, eye bags or dark circles appear. 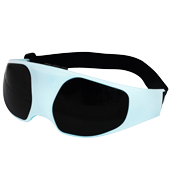 In case of frequent headaches or eye pain, neuralgia and insomnia. I started wearing glasses back at the elementary school, and did not even hope I could get rid of them one day. I have tried different eye exercise, but nothing worked. With the help of eye massager OptiMaskPro I eventually managed to improve my sight. Now I almost never wear glasses and I put the on only when I need to recognize something that is somewhere really far in the distance. I work as an IT technician and I often visit my customers at home. So all day long, I either stare at the monitor or I watch the road from the car. Over the last year, my sight deteriorated by one diopter. 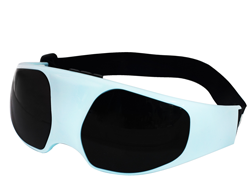 I did not want to wear glasses so I ordered this device. It was a cheap and efficient solution. I can go for an eye check-up without any worries, because my sight is OK now. OptiMaskPro is a brilliant device. It relaxes face and relieves pain so efficiently that I don’t even remember when the last time I visited a pharmacy was. I use it almost every day. I am sleeping better and I feel a lot more comfortable. You will achieve the best results if you use three times a day for 3 - 5 minutes (up 20 minutes maximum). You need to remove contact lenses before using the device. Put batteries into the device before first use (not included in the package). Put the device on your eyes, turn it on, choose mode and set time. Contraindications for the use of this device are head injury, burns, inflammatory processes in the eye area and recovery period after eye surgery. So magnetic acupuncture device for eye message called OptiMaskPro is a unique device for home use that allows you stabilize and improve sight, sleep well, and forget about headaches.